The HI96771 Ultra High Range Chlorine Portable Photometer combines accuracy and ease of use in an ergonomic, portable design. A user can accurately determine the concentration of chlorine over two ranges. The HI96771 has a 0,00 to 5,00 mg/l (ppm) free chlorine low range and a high range mode that measures chlorine up to 500 mg/l (ppm). The HI93701-01 reagents are used for the low range free chlorine measurement while the HI95771-01 are used for high range chlorine measurements. 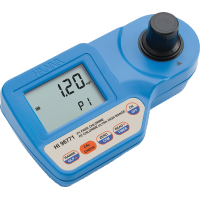 The HI96771 offers many advanced features including the exclusive CAL Check™ function used for performance verification and calibration of the meter. The HI96771 portable photometer is for the measurement chlorine over a very wide range. Most chlorine photometers are limited to very low concentrations of chlorine. To measure a concentration outside the measurement range involved performing a dilution. The HI96771 has a unique chemistry that allows for the measurement of samples with chlorine concentrations up to 500 mg/l (ppm) without having to perform a dilution. This portable photometer features an advanced optical system; the combination of a special tungsten lamp, a narrow band interference filter, and silicon photodetector ensure accurate photometric readings every time. 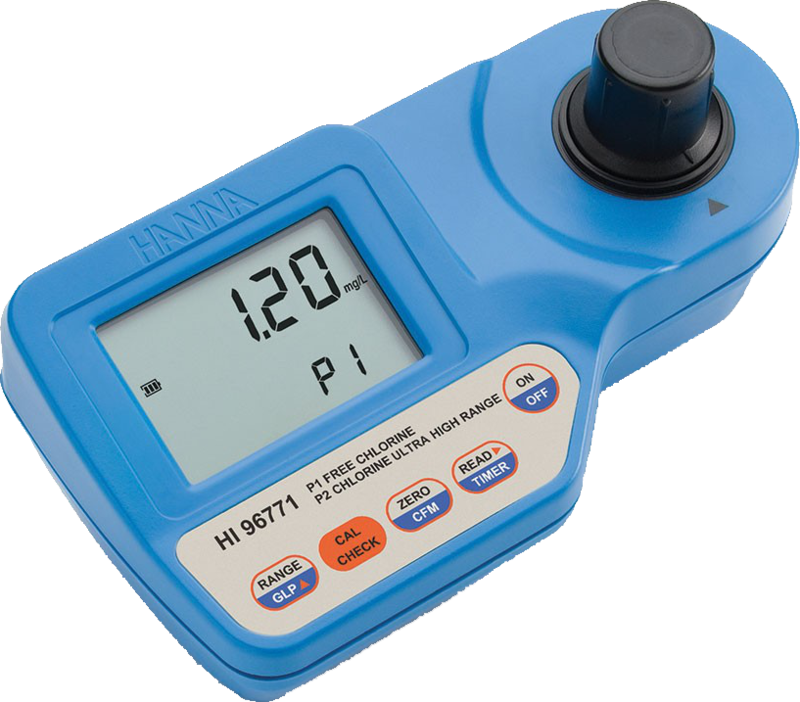 The Hanna exclusive CAL Check™ feature utilizes ready-made, NIST traceable standards to verify both meter validation and calibration. The exclusive cuvette locking system ensures that the cuvette is inserted into the measurement cell in the same position every time to maintain a consistent path length.